During the longest drought in California's modern history, a pair of UO researchers headed into the woods of the Sierra Nevada to investigate how forest composition affects water supply and what changes may come as climate change alters the ecological makeup of forests. What they found is a way to use the relationship of trees and soils to predict shifts in water and carbon levels in these mountain forests and watersheds. Combining their findings with historical data, they suggest a possible 10 to 60 percent increase in regional water loss as climate change pushes tree species to migrate to different elevations. UO postdoctoral researcher Toby Maxwell of the Institute of Ecology and Evolution and Lucas Silva, a professor of environmental studies and geography, led the study, which was done in collaboration with soil scientist Will Horwath of the University of California, Davis. The study appeared in the Proceedings of the National Academy of Sciences. "The California drought was expected to cause changes to montane forest landscapes and we were interested in trying to understand how these changes might affect the cycling of two important natural resources – water and carbon," said Maxwell, the study's lead author. "We found that the interplay of tree species and soil properties is useful for better understanding carbon-water relations and for predicting changes to how water is moving through these forests." The researchers focused on forest composition because trees play a pivotal role in the movement and availability of water. This occurs primarily through transpiration, a process in which moisture moves from trees into the atmosphere. If a tree transports more water from the soil to the atmosphere, less water will flow into rivers and reservoirs. But the exact nature of each tree's role and what that means for water and carbon levels varies widely based on a number of biological and environmental factors. These factors are ever-changing, researchers said, because forests are changing alongside the climate as plants and trees react to rising temperatures and fluctuating precipitation patterns. In the Sierra Nevada, there are years of data showing certain kinds of trees start growing at higher elevations as the state's climate trends hotter and drier. "Long-term monitoring plots across the Sierra Nevada show expansion of broad-leaved trees toward higher altitudes," Silva said. "One of the main responses to climate change in mountain environments is tree migration uphill." 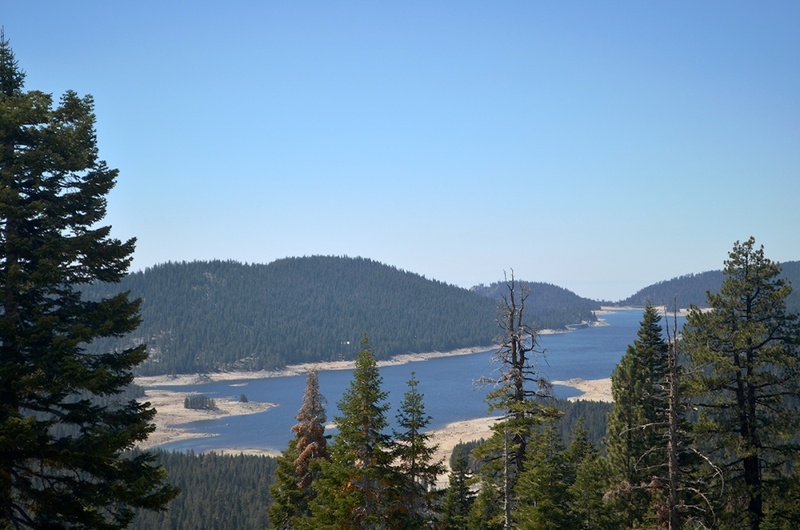 Considering that these forest watersheds provide water for as many as 20 million people in California, shifts in these forests – and the water flowing through their watersheds – could have significant ramifications for the state. "One of the main reasons I was interested in researching what changes in forest composition could mean for water and carbon cycles is because of the implications for natural resources and these landscapes," Maxwell said. Maxwell was also interested in using his research to examine an area of great uncertainty in how forests function: the interplay of soil and tree species. From three different altitudes in the Sierra Nevada, from granite slopes outside Lake Tahoe to the volcanic flanks of Mount Lassen, they collected 225 samples of soil and plant litter and 345 leaf samples from nine species of trees to measure water-use efficiency – an index that shows how much water is lost via transpiration relative to the amount of carbon dioxide they remove from the air – across different landscapes. "I got my second Ph.D. in grinding plants," joked Maxwell, who recruited the help of a coffee grinder and acid solutions to work his way through the early stages of extracting cellulose from hundreds of leaves and pine needles. One of the first observations was a puzzling one: The data showed that trees in locations with the highest levels of precipitation were the most water-stressed – meaning the trees were rationing water because they sensed it was a scarce resource. That seems counterintuitive, given the significant rainfall in the region where these trees were located, Maxwell said. When the researchers dug deeper into the data and examined the soil, they discovered that the ground was not retaining much water, limiting transpiration. This was one of their first important discoveries in understanding how soil and species interact to influence how water moves from the land to the air. They continued to sort massive amounts of data to extract information about how each species of tree transports water and how that changes based on the soil they're rooted in. "It was pretty noisy data at first. It really was that interaction between trees and soil development that led to meaningful takeaways," Silva said. "If you just look at trees, you see a bunch of data points, with no clear trend. Once you consider their interactions with soil and atmospheric change, it really makes sense." By examining the interactions, they were able to turn their complicated dataset into condensed findings that help pinpoint which combinations of trees and soil produce different levels of transpiration. "We found that the amount of water loss varies widely among different tree species and that different types of soil regulate that affect," Maxwell said. Silva added, "When you put the two together, you can move from understanding what's happening at a leaf level to understanding what it means for the landscape." The findings should be helpful for forest managers and policymakers as they think through how to strategically manage forests and natural resources, Maxwell and Silva said. The information also should help in the modeling of how climate change will affect landscapes. Maxwell plans to continue this research in Silva's Soil-Plant-Atmosphere Research Lab at the UO through a newly awarded grant from the National Geographic Committee for Research and Exploration. The new study, "The Climate Paradox: Mapping Resilience and Vulnerability of Montane Forests," will incorporate new sites from forests across Oregon. The researchers plan to generate regional maps of water use and carbon sequestration in a collaboration with scholars at the Infographics Lab in the UO Department of Geography.